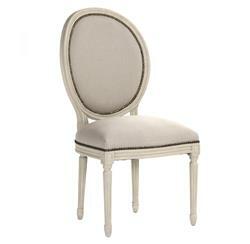 Brass nail head studs surround the natural linen oval back of this pair of delightful dining side chairs. Complete the French country look in your European-inspired home by using these chairs to provide elegant seating for your family at nightly fondue feasts. Item sold as a pair.